I find these kind of threads to be fun so lets get one started again. I'm changing dies in my Star sizer and waiting on the heater to get the lube softened up. I have a couple gallon jugs each or H&G 503's and H&G 68's to size. I'm also looking out of the window at the barren soybean field behind the house and the cold dreary weather and thinking about all of the years that I worked out in it. 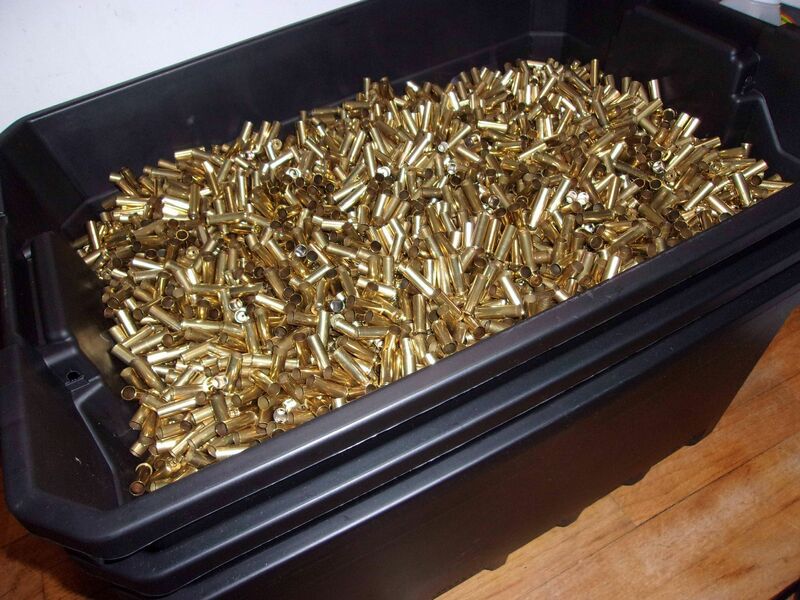 I just finished drying 5 gallons of 38/357 mag brass that I wet tumbled clean last night. I'm using a homemade brass dryer I invented that uses stacked plastic tubs and two 100 watt equivalent halogen light bulbs. The top tub that the brass is inside has hundreds of holes I melted in the bottom with a soldering iron. The holes allow the heat from the light bulbs to permeate up and through the brass. The middle tub has a large hole in the center for the heat from the light bulbs to pass through while still shielding the bulbs from any dripping water and the bottom tub allows the room for the light bulbs. The bottom tub and top tub lid also have vent holes to allow the heat and moisture to circulate up and out. All 3 tubs are not the same height. The bottom tub is the deepest to allow extra room for the light bulbs. I was able to dry all 5 gallons of brass in only a few hours. Tumbling clean all 5 gallons of brass took 3 hours to tumble in 3 separate tumblers. Each batch tumbled for 1.5 hours and I ran 6 of those batches. Total hands on time spent loading the tumblers and later rinsing the 5 gallons of brass and dumping them in my homemade dryer was under 1.5 hours. So with this setup I'm able to clean 5 gallons of brass with about 1hr 15 min of actual hands on work and 3 hours total of wet tumbling. Back to sizing bullets today. When I get tired or bored I'll start back to reorganizing my ammo storage. Years ago I just dumped loaded rounds directly into ammo cans. Now I put them in ZipLoc bags first, with labels containing dates, loads, counts/amounts, ect. I'm also spraying the lid gaskets with Silicon spray while I have them empty. Still spending a few hours a day sizing bullets. After that I spend a little time on my ammo storage. Still sizing bullets and still sorting ammo. Scored a bare loadmaster today for an extremely good price. Just need to come up with shellplates and a space turret, then I can swap 40 and 45acp from the pro1000 and keep it for just 223/300aac. Got multiple things going on this week. Deer season closed Sunday so I'm back home. Got the Ranger washed up and the truck unpacked. Got a drum of range brass on the tumbler. Still sizing bullets. Still moving loaded ammo to ammo cans. Got a half of a bucket of wheel weights to sort. I smelt wheel weights in batches of 350-400# and it looks like I almost have enough to smelt pretty soon. It looks like I won't be doing very much for the rest of the year. Have lots of company coming over for Christmas and we're trying to get the house in order, and keep it in order. Then gun deer season opens again for a few days after Christmas. I took today to tidy up in the loading room a little and sorted a little range brass. Added a few cases to my trade page. Last edited by Pacomdiver; 12-22-2018 at 01:48 PM. It was I that got the 40 TL TC mold, have it tried it yet, still trying to get a decent space to cast. As for the pro1000, it runs pretty well(if a bit finicky) when you learn what it likes. But I don’t really load conventionally on it. I size rifle cases on a single stage so that I can trim, tumble, and hand prime. So I just charge, seat, and crimp on the pro1000. I also switched to an auto drum as opposed to the auto disk, it’s much more consistent with a positive spring return, the chain is just to prevent double charges. From what I’ve read about the loadmaster, the priming system is the weak link, so I’m going to bypass that altogether and hand prime pistol cases too. I’ll remove the decap stem from the sizing die and put either a powder cop or bullet feeding die in station 3. I’ll keep the pro1000 around for now for 300aac and 223rem, maybe I’ll eventualy move them to the loadmaster too, it would certainly clean up the bench. i also preprepped my cases, so i just put a RTL case in and loaded it, worst part of it was , i had about half of a dillon 550 invested in it with the toolheads and extras i bought but live and learn. Got my loadmaster running last night, cranked out 180 rounds of 40s&w in pretty short order. Now I’m out of brass, might try loading a bit of aluminum, just to try and see. anybody still having problems with pictures not loading from their computer to here? ive tried a couple times and it loads, then says it had "failed"
With the Holidays past I'm back to sorting ammo again. I'm doing this while the tumbler is running. I'll dry and sort that brass and start all over again. I’ve generated a few hundred empties over the last few days, so I’m good, just need to sit down at the bench again. Last edited by Pacomdiver; 01-02-2019 at 06:27 PM. What a wonderful day in the reloading room. Got everything all nice and tidy for a change. Loaded up 250 300blk using 150 plated flat nose/base and 250 with the lee 230gr boolit powder coated. Going to shoot both suppressed. I've shot the 230gr ones earlier this year and I asked the hog if it was a good boolit...but the guy just wouldn't talk. Interested in seeing how the 150gr plated do, but again...I don't think the hogs will be very helpful...atleast not verbally. You run much larger batches than I do... I’m lucky to be able to buy 500 bullets for a given caliber at a time, but that should improve once I get a space in the garage set up to cast. I’ll tumble somewhere around 1000 40 or 45 cases, 750 or so 223, and maybe 800 300aac at a time. But I only use a frankford arsenal wet tumbler.